The SpanishFly was born in spring/summer 2000, the legend Frankie Hubbard travelled to England to meet up with Colin Broadway and together they designed and produced a few canoes for the 2000 rodeo pre worlds in Sort, Spain. 2 of these canoes, one blue and one purple were made from super linear plastic the rest, grey, purple or mint green in colour were linear plastic. We loaded up our truck with 13 freshly cooked S'Flys and cruised from Nottingham, England to Sort, Spain. The event was great, the new canoes awesome, it was the start of something big. One year later Colin sold the SpanishFly mould, and the Prelude mould, to Pyranha. Pyranha design experts changed the hull shape slightly, filling in the concave edges and flatting the hull slightly. In 2008 Pyranha sold the two moulds to Esquif, who are the current proud owners of my favourite lump of aluminium. 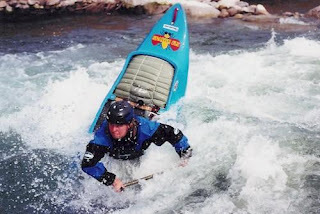 I have fallen in love the SpanishFly, it is the canoe for everything white water; I learnt cartwheel and blunt, I can creek and multiday, huck big waterfalls and run big volume, this canoe does it all. 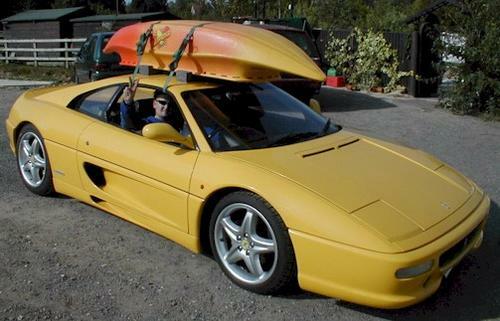 No SpanishFly blog would be complete without a photo of one on the roof of a Ferrari! I have enjoyed countless happy days kneeling in a SpanishFly and to celebrate a great boat and and even greater designer here are a few photos and words to big up one of the best boats on the river, thanks Homie. My first SpanishFly was the blue super linear canoe made in England by Sauvage Designs; I made my first back loop, ran my first big waterfall and won my first European Cup series, thanks blue SpanishFly. In 2004 I cut 30cm out of the middle of a SpanishFly and welded it back together, the result was a canoe that was way better in a hole and easier on a wave, the draw back is that they are a bit slower and less stable, but the S,Fly is pretty quick and very stable so this was not such a bad thing. We also cut more out of one, about 50cm but this was too much, there was just 2ends left welded together and no hull, IF you could get it into a sticky hole it was good but otherwise it was just too short, oh well you live and learn! A super clean cartwheel sequence in a cut down SpanishFly, the überfly, at the 2005 rodeo worlds at the Penrith white water stadium, Australia. The cut down SpanishFly wasn't just good for rodeo it could still huck the meat on the river and bring home the dinner when it needed too. Hucking Mauria Falls in New Zealand on Christmas Day 2004, in the überfly. Fishing on Lake Mahinapua, the überfly is the secret hero of canoe fishing! In 2008 Esquif became the proud owners of the SpanishFly mould and my love affair with the Fly started again like a teenage romance, we went to Nepal for a month of big volume multidaying, on the Bhote Kosi, Sun Kosi, Tamur and the Trisulli. 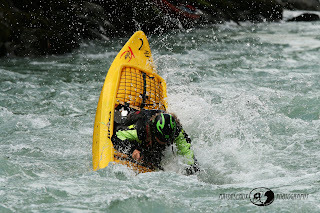 I was the first person to enter the Himalyan White Water Challenge in an open canoe, and nearly made the finals of the kayak freestyle! Last year I was lucky enough to get a trip down the Grand Canyon with 9 friends, there was only one choice of canoe, it was of course my beloved SpanishFly, the white water canoe for everything. Blasting through the middle of house rock hole on the Grand Canyon, with the S'Fly every minute on the river puts a smile on your face. This is one of the most recent photos I have of me and my SpanishFly busting a wave wheel on the Imster Schluct in Austria, the boat just rocks! Happy birthday SpanishFly you rock and thanks Frankie for making the best white water canoes.